The Row - Voluminous silhouettes are a key theme in The Row's SS19 collection which includes this white Sora dress. 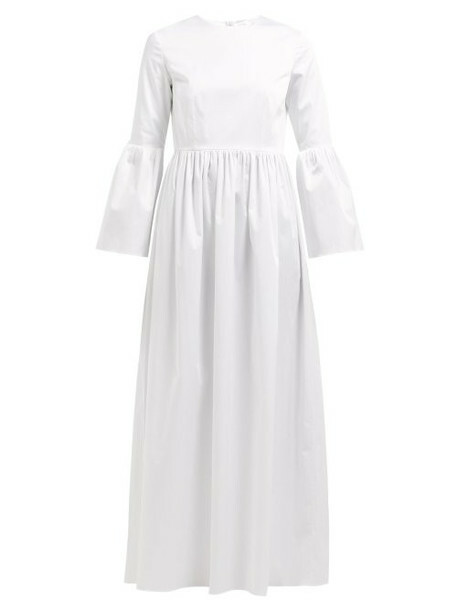 It's crafted in the USA from stretch cotton-poplin and shaped with long darts that run through the bodice and oversized fluted cuffs at the end of the cropped sleeves, then falls into a long skirt, shaped with gathers along the waistband seam. Emulate the label's minimalist aesthetic by teaming it with a clutch and pumps for an evening occasion.